Beat butter until creamy. Gradually beat in white and brown sugars until well incorporated. Beat in eggs one at a time and beat in vanilla. In a separate bowl, combine flour, baking soda, cocoa powder, and salt. Gradually add dry ingredients into butter mixture, beating well. Cover and chill dough for 30 minutes. Combine 1/2 cup nuts with 1 tablespoon sugar in small bowl. Place 1/4 cup sugar into another small bowl. Divide dough into 4 parts. Divide each of the 4 parts into 12 pieces to get 48 cookies. Take a piece of dough and form it into a bowl shape. 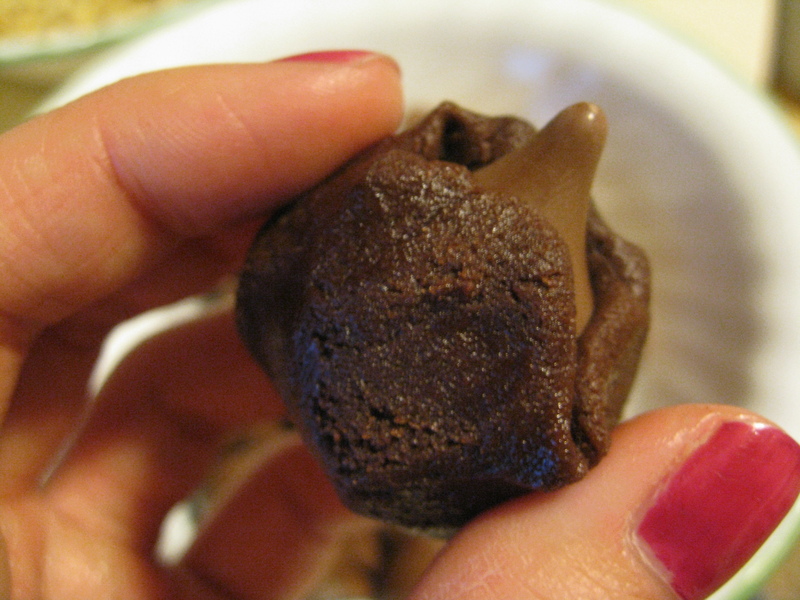 Place chocolate in the center of the cookie and mold the dough up around the candy. 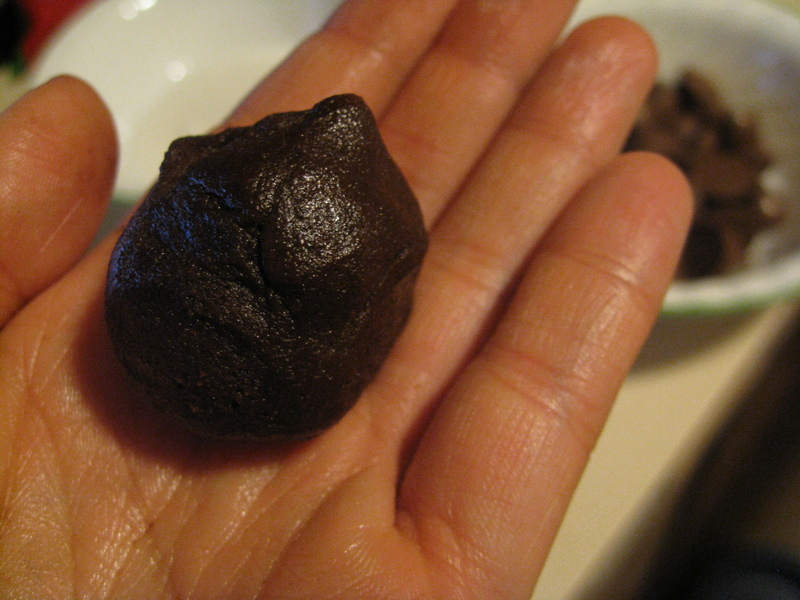 Roll the cookie in your hands to mold into a smooth ball. Roll cookie into a ball and dip top into sugar or sugar/nut mixture. Place cookies, sugar/nut side up on ungreased cookie sheets and bake for 8 minutes. Let cookies cool completely on cookie sheets before removing. 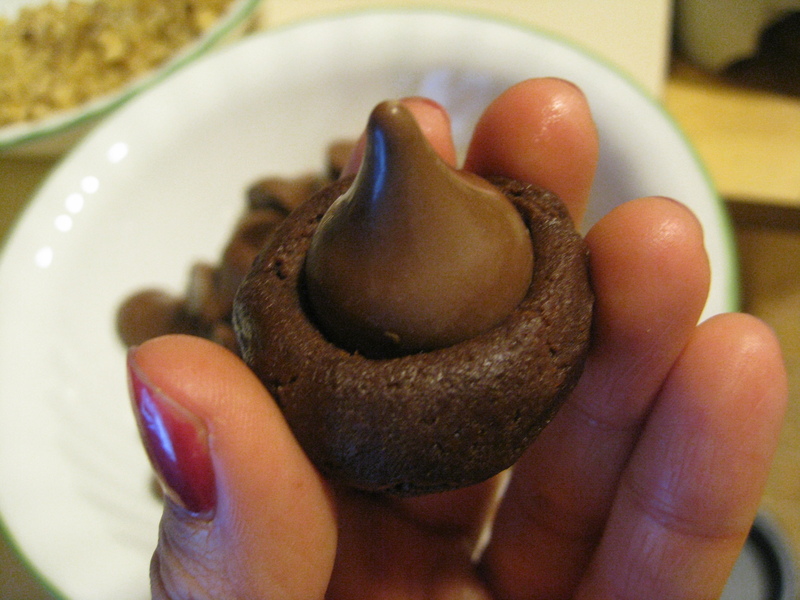 *I used Hershey’s Milk Chocolate Kisses with Caramel. They were great – the caramel stayed soft inside and it was easy to shape the cookie around them. I may try another chocolate next time, though! 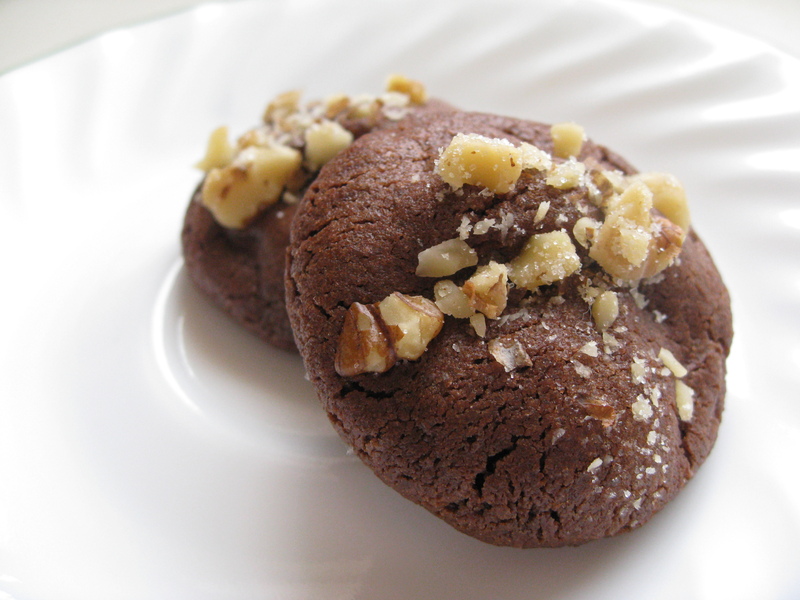 Categories: Chocolate, Cookies, Dessert | Tags: chocolate, cookies, dessert | Permalink. Dietitian by day and Midwest food blogger by night. Lover of whiskey, running, and all things food. Sign up to get notifications of blog updates by email.